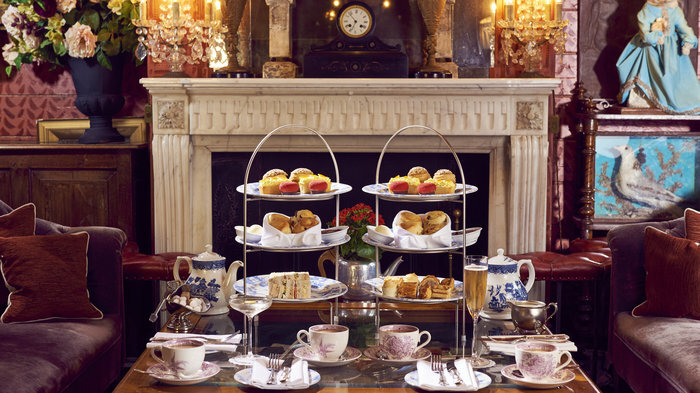 A much-loved tradition for locals and visitors alike, London boasts some of the best afternoon tea experiences in the country. And, while nibbling on scones at The Ritz or feasting on finger sandwiches at Claridge's might be on everyone's bucket list, sometimes we all crave a more informal and, let's be honest, cheaper option. Read on to discover the best affordable afternoon tea in London, each of which is indulgent and stylish enough to do the British custom justice. Awarded Best Afternoon Tea at the Harden's London Restaurant Awards 2016, the Ham Yard Hotel is a stylish and affordable option. Served all day, it's served in the hotel's bar and restaurant, the Orangery or, for hotel guests, the Drawing Room and offers an indulgent choice of afternoon tea savouries, cakes and scones with clotted cream and preserves. The tea is only £22 per person but diners can choose to add heartier dishes such as a chorizo hash croissant with aubergine yoghurt; a smoked ham, gruyere, mascarpone and thyme melt; and Ham Yard rarebit with baby watercress. Make it a boozy affair with a glass of champagne or opt for one of the 12 speciality teas and infusions. Additionally, there's the choice of ensuring there's something for everyone, savoury, healthy, sugar free, gluten free and vegan options. Both the Marylebone and Clerkenwell Zetter Townhouse serve traditional afternoon tea in their cocktail lounges. Step into Seymour's Parlour or Aunt Wilhelmina's Cocktail Lounge to feast on a range of indulgent bites alongside a cuppa, a cocktail or a glass of bubbly. At both venues, you can choose between Aunt Wilhelmina's selection of dainty finger sandwiches or Uncle Seymour's heart treats. Sandwich fillings include smoked salmon with cream cheese and dill, egg mayonnaise with watercress, and honey roast ham with mustard mayonnaise. Seymour's treats, meanwhile, include a truffled sausage roll with homemade brown sauce, a mini croque monsieur, and a devilled egg and espelette pepper. Plain and raisin scones come with Cornish clotted cream and strawberry preserve while the sweet conclusion comes in the form of a malted milk chocolate mousse and bitter chocolate brownie; a salted caramel and apple choux bun; and a lemon and elderflower cake with Chantilly cream. Blueberry and lemon 'smokey eye mascara', rhubarb and ginger 'shimmer brick', and pecan and jasmine 'long-wear cream shadow' are all part of the delectable Bobbi Brown Afternoon Tea at Balthazar. Launched in 2015 to mark the 25th anniversary of Bobbi Brown Cosmetics, the indulgent tea is now a permanent feature. Having spent over a decade specialising in the subject of afternoon tea at The Ritz, Balthazar's head chef Regis Beauregard put together the tempting menu, which also includes a selection of classic finger sandwiches - expect cucumber, smoked salmon, coronation chicken and egg mayonnaise - and freshly baked scones with Devonshire clotted cream and homemade strawberry jam. Tea of all types is on the menu, but for a real treat try Bobbi's Sparkle, made with Sipsmith gin, elderflower, lemon and champagne. There's also the option of adding a glass of Gaston Chiquet Champagne. Located in Covent Garden, it's the perfect location for West End shoppers and theatregoers. Set in the perfectly manicured grounds of historic Kensington Palace, The Orangery offers an idyllic setting for afternoon tea for those who want tranquillity and breathtaking views. A great way to enjoy the refreshments on offer here is to first work up an appetite with a stroll through picturesque gardens open to the public and once a favoured retreat of Diana, Princess of Wales. When you're ready to relax and quench your thirst, head for the gleam of starched white linen glistening through the Orangery's spectacular floor-to-ceiling windows. Once inside shadowed by graceful Corinthian columns and sweeping arches and rows of orange trees in urns enjoy a traditional afternoon tea complete with finger sandwiches, orange-scented and currant scones with Cornish clotted cream with English strawberry jam, and an array of pastries. The afternoon tea is only £28.50 per person or opt for one of the boozy options, with prices from £34.50. Everything about the Dean Street Townhouse is very British so there's no better place to enjoy the very British tradition of afternoon tea. Served in the elegant Dining Room, it offers a menu of finger sandwiches filled with cucumber and cream cheese, smoked salmon and horseradish, and Burford brown eggs and mayonnaise. Following the savouries, diners can tuck into fruit scones with homemade preserves and clotted cream along with traditional British cakes such as lemon drizzle and Battenberg. Alternatively, book in for cream tea, with which you can add crumpets, a selection of sandwiches, a slice of cake or a selection of cakes. There are ten types of tea to choose from, including all the classic favourites like Earl Grey, peppermint and fresh mint, as well as Collet Brut champagne. Priced at just £8 for cream tea and from £21 for afternoon tea, it's definitely one of London's better value options. Both The Modern Pantry in Clerkenwell and Finsbury Square offer affordable afternoon tea menus, with two adventurous menus for just £22.50 or £27.50 with a glass of bubbles. At the Clerkenwell branch diners can feast on a feta, corn, mint and chilli filo tartlet; a chorizo scotched quail egg; and a roast courgette, pea and pecorino fritter with roast tomato curried yoghurt and pickled mustard seeds. Perhaps not one for traditionalists, the scones are savoury with cheddar, chive and garlic and basil and black pepper flavours while sweet treats include a pandan, vanilla and raspberry Battenberg cake, a mojito and gooseberry lamington, and peach marshmallow. In Finsbury Square, the menu features sweetcorn, polenta and feta fritters and a crab, avocado and lemongrass braised cherry tomato brioche bun. Scones are flavoured with chocolate and chilli and gochugaru and spring onion, and sweet indulgences include a pink peppercorn, rose and pistachio macaroon and a matcha and coconut lamington. Despite its grandeur setting, the German Gymnasium offers one of London's most affordable afternoon tea options. Served in the Grand Café within the Grade II listed building, there are two teas to choose from - The German and The Austrian - both of which take inspiration from the venue's heritage. Priced at £18.50, with the option of adding a glass of sparkling wine for £4.50, both the menus include a selection of sweet and savoury dishes. The German includes three mini rolls - black forest ham, celeriac remoulade, egg mayonnaise and Atlantic shrimp - as well as a black forest macaroon, nussecken (nut bar) and rote grutze (fruit compote) with vanilla sauce. The Austrian, meanwhile, features Tyrolean hay speck, smoked salmon with cream cheese and cucumber mini rolls as well as apple strudel with vanilla sauce and opera cake. Providing the chance to enjoy a quintessentially British experience within one of London's most beautiful buildings, Benugo has partnered with the Victoria and Albert Museum to serve traditional Victorian Afternoon Tea. The award-winning British food business and the renowned museum invite visitors to feast on sandwiches and scones within the lavishly decorated Morris Room, which boasts a historic interior that was part of the V&A's original refreshment rooms. invite visitors to feast on sandwiches and scones within the lavishly decorated Morris Room, which boasts a historic interior that was part of the V&A's original refreshment rooms. Curated by award-winning food historian Tasha Marks, the menu is filled with dishes inspired by 19th-century recipes, subtly tweaked to suit the modern palate. Think Mrs Beeton's cucumber sandwich, first seen on menus in 1859; iced orange cake, circa 1891; lemon and caraway poppy cake, circa 1895; and the traditional Victoria sponge which first appeared on Victorian tables in the 1800s. The feast is served with a selection of organic loose leaf teas and an optional glass of prosecco. Discover London's best afternoon tea experiences here. Served in The Orangery or private garden, afternoon tea at Number Sixteen is a sophisticated affair. Housed within a grand Victorian townhouse in leafy South Kensington, the hotel still retains the feel of a private residence so guests can pretend they're taking tea in their very own home. Tuck into finger sandwiches filled with honey roasted ham and mustard, cream cheese and cucumber, truffled egg and watercress, smoked salmon, and Dorset crab. Both fruit and plain scones are on offer, served with clotted cream and preserves, while sweet treats include strawberry cupcakes, Battenberg cake, a chocolate brownie and raspberry cheesecake. The afternoon tea experience is Â£22 per person but guests also have the option to purchase one of the speciality teas and infusions or upgrade to a boozy afternoon tea from Â£29. From cheap budget accommodation to luxury 5 star suites see our discounts for hotels, including Grange Holborn Hotel London from 56% off.